From October 5th until October 8th, King Carl XVI. 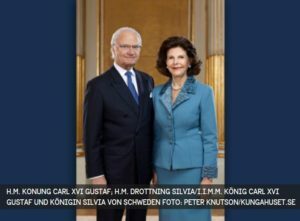 Gustaf and Queen Silvia of Sweden will be in Germany, following an invitation from Federal President Joachim Gauck. The royal couple will stay for four days and will visit Berlin, Hamburg, Lutherstadt Wittenberg and Leipzig. Their programme focuses on the topics innovations, sustainability and openness. In 1993, the Swedish royal couple last came to Germany on a state visit. Honorary Consul for Lower-Saxony, Jasmin Arbabian-Vogel, will also be part of the state banquet in the castle Charlottenburg. On Friday, October 7th, King Carl XVI. Gustaf will officially hand over the certificate of appointment for the consulship for lower Saxony in the Swedish Embassy Berlin.